Detroit is the most populous city in the U.S. state of Michigan, the fourth-largest city in the Midwest and the largest city on the United States–Canada border. It is the seat of Wayne County, the most populous county in the state. Detroit's metropolitan area, known as Metro Detroit, is home to 5.3 million people, making it the fourteenth-most populous metropolitan area in the United States and the second-largest in the Midwestern United States (behind Chicago). 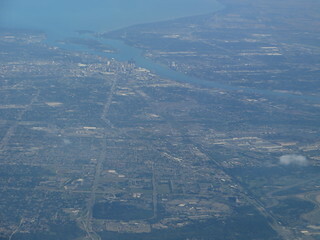 It is a major port on the Detroit River, a strait that connects the Great Lakes system to the Saint Lawrence Seaway. The City of Detroit anchors the second-largest economic region in the Midwest, behind Chicago, and the thirteenth-largest in the United States. Detroit was founded on July 24, 1701, by the French explorer and adventurer Antoine de la Mothe Cadillac and a party of settlers. With expansion of the automobile industry, the Detroit area emerged as a significant metropolitan region within the United States in the early 20th century, when the city became the fourth-largest in the country for a period. In the 1950s and 1960s, expansion continued with construction of a regional freeway system. Due to industrial restructuring and loss of jobs in the auto industry, Detroit lost considerable population from the late 20th century to present. Between 2000 and 2010 the city's population fell by 25 percent, changing its ranking from the nation's 10th-largest city to 18th. In 2010, the city had a population of 713,777, more than a 60 percent drop from a peak population of over 1.8 million at the 1950 census. This resulted from suburbanization, industrial restructuring, and the decline of Detroit's auto industry. Following the shift of population and jobs to its suburbs or other states or nations, the city has focused on becoming the metropolitan region's employment and economic center. Downtown Detroit has held an increased role as an entertainment destination in the 21st century, with the restoration of several historic theatres, several new sports stadiums, and a riverfront revitalization project. More recently, the population of Downtown Detroit, Midtown Detroit, and a handful of other neighborhoods has increased. Many other neighborhoods remain distressed, with extensive abandonment of properties. The Governor of Michigan, Rick Snyder, declared a financial emergency for the city in March 2013, appointing an emergency manager. On July 18, 2013, Detroit filed the largest municipal bankruptcy case in U.S. history. It was declared bankrupt by Judge Steven W. Rhodes of the Bankruptcy Court for the Eastern District of Michigan on December 3, 2013; he cited its $18.5 billion debt and declared that negotiations with its thousands of creditors were unfeasible. On November 7, 2014, Judge Rhodes approved the city's bankruptcy plan, allowing the city to begin the process of exiting bankruptcy. The City of Detroit successfully exited Chapter 9 municipal bankruptcy with all finances handed back to the city at midnight on December 11, 2014.